I needed some Thanksgiving dinner ideas for this site, but I’m not much of a chef. So I had a friend write the article below for me. Also there are some links for recipes at the bottom of this page, too. My kind of dinner ideas involve going to the diner or ordering pre-prepared meals from the grocery store and relying on my sister to heat it all up. I hope you dig the ideas. For more Thanksgiving pages on this site including, humor Thanksgiving quotes, poetry, prayers and more visit the Thanksgiving Day main page. When the Pilgrims first sat down with the Indians in what was to become America’s annual smorgasbord known today as Thanksgiving Dinner, one can only be sure that a wide variety of meats and vegetables were offered much to the delight of those attending. Reports vary on what exactly was served-up, but it is widely accepted that they offered up a sampling of most items available at the time such as venison, duck, goose, fish, lobster, and the venerable turkey. Why the turkey has become the main-stay in a Thanksgiving dinner is perhaps as much a matter of excellent marketing as it is anything else, but most agree that the turkey, with its wonderful flavor, is certainly a good choice. One of the wonderful things about Thanksgiving Dinner today is that at least in our house, much like the turkey has become a tradition, other dishes have stepped up to meet the test of time as well. People have come to name our family’s traditional dishes by simple association to their creator and their unique recipes that have been shared at many a table. Feel free to use our humble family for a source of Thanksgiving dinner ideas. Not one to just clean up the bird, stuff it with bread crumbs, and to throw it into the oven, Uncle Johnny goes to great lengths to make a special turkey for Thanksgiving. Armed with a needle, experience, and a vivid imagination, Uncle Johnny is known to inject the turkey in different sections with a wide variety of different flavors such as teriyaki, ginger, and even cinnamon that create simply mouthwatering turkey with almost indescribable flavor bite after bite. And he doesn’t stop there. An interesting Thanksgiving dinner idea is to have another main course. Yes, something other than turkey. To offer a complementary addition, Uncle Mike’s blackened beef tenderloins are barbequed every Thanksgiving outside on the charcoal grill come rain, sleet, or snow. Nobody knows how to sear a piece of meat to hold in the juices while making a “crunchy” outer coating on the meat yet having the inside come out a perfect medium rare like Uncle Mike. To simply call them mashed potatoes is a bit of an insult, as these potatoes made with garlic, pearl onions, and a hint of rosemary are the only way one can do Uncle Johnny’s gravy justice with a potato. Cooked to perfection with brown sugar/orange juice syrup these will just melt in your mouth. A wonderfully crafted salad with spinach, red cabbage, red onion, walnuts and a raspberry-vinaigrette dressing with crouton’s is a special annual treat. A soufflé of creamed corn, corn meal, egg, and mild cheddar cheese – just try to keep the kids away from this dish! Somebody either forgetting the dinner roles or burning them in the oven! Nobody really knows what to call Aunt Janie’s desserts except delicious! Offering a wide variety of fudges, desert squares, and pies, one always seems to be able to save enough room for a slice of her infamous pumpkin pie with whipped cream topping. The Food Network – They have tons of Thanksgiving dinner recipes from famous celebrities. 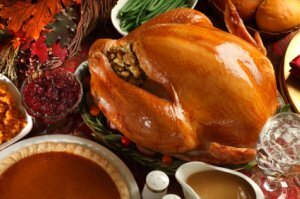 Delish.com – has a really great ideas on making Thanksgiving dinner in “a flash.” They have a 45-minute plan, 60-minute plan and potluck ideas, too.